An Early Cretaceous lithostratigraphic unit called the “Wealden Group” in Southern England is famous for the many remains of dinosaurs and other prehistoric critters that were found in there. The name is derived from an originally heavily forested area in Sussex, Surrey and Kent known as “the Weald” (forest in Anglo-Saxon) and is subdivided into the “Lower Wealden Group” (Berriasian-Valanginian) and the “Upper Wealden Group” (Hauterivian-Lower Aptian). We’ve already talked about the Ornithopods of the Lower Wealden in two of its formations, the Wadhurst Clay and Turnbridge Wells Sand Formations (See Ornithopods of the British Isles, Part I). Let’s now review the comparatively richer Upper Wealden Group Ornithopod fauna from the Wessex and Vectis formations (Barremian to Lower Aptian) that contains as of 2011, 6 species. Fig 2.- Highly speculative reconstruction of Valdosaurus canaliculatus as a dryosaur. Hypsilophodon foxii is known from several well-preserved skeletons from the Isle of Wight. 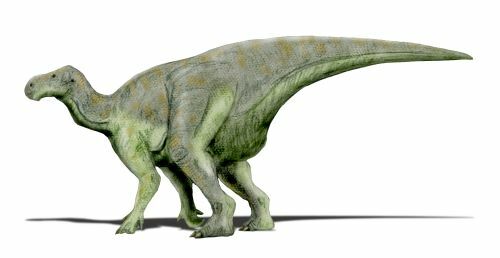 This lightly built bipedal ornithopod measuring about 2 meters in length was once thought to be a juvenile Iguanodon. For a century, it was also thought to be arboreal until Peter Galton disproved this hypothetical lifestyle with solid anatomical evidences in 1974. Fig 3.- Dollodon seelyi, a 6.5 m long gracile iguanodont. Next in size comes the obscur Valdosaurus canaliculatus (Originally "Dryosaurus canaliculatus"), also from the Isle of Wight, based on a pair of femora of possibly juvenile specimens. The current best guess is that it was a medium-size Dryosaur. The dubious “Camptosaurus” valdensis might be the same animal. Iguanodonts are represented by the 6.5-meter long facultative bipedal form Dollodon seelyi (Originally “Iguanodon seelyi”) and the massively built 8-meter long quadrupedal Iguanodon bernissartensis, the only one of the several beasts that was named Iguanodon to retain the name without quotes (For the anecdote, the ICZN has, in year 2000, made I. bernissartensis the new type species of Iguanodon, because the former type, “I. anglicus” was found to be dubious). These two species are known from several remains found both in Southern England and the contemporary Sainte-Barbe Clays Formation in Belgium. Carpenter and Ishida have named a third species, Proplanicoxa galtoni, based on a set of postcranial elements in 2010. Fig 4.- The heavily built 8 m long quadrupedal Iguanodon bernissartensis. 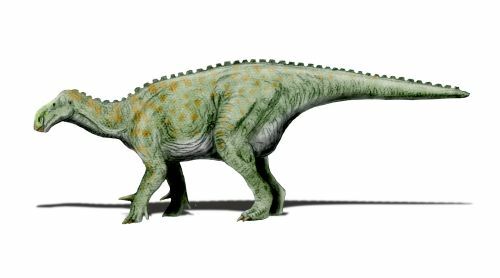 In the slightly younger Vectis Formation of the Upper Wealden Group (Early Aptian), Iguanodon bernissartensis is associated with a fourth iguanodont, the gracile and probably bipedal form Mantellisaurus atherfieldensis (Originally “Iguanodon atherfieldensis”). Andrew McDonald (2011) has recently questioned the validity of the genera Dollodon and Proplanicoxa claiming their strong similarities with Mantellisaurus. However, the author has since withdrawn the paper accepted for publication in Cretaceous Research. The fragmentary fossils named Sphenospondylus gracilis and Vectisaurus valdensis are considered to be synonyms of Mantellisaurus. Fig 5.- The gracile iguanodont 6 m long and probably bipedal Mantellisaurus atherfieldensis. All is not settled yet in the wild world of the British Ornithopods. 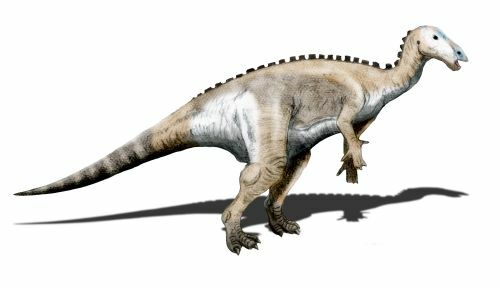 For instance, one specimen of “Iguanodon mantelli” from Maidstone, Kent which was referred to Mantellisaurus by Greg Paul, is seen as a different species awaiting a new generic name by Carpenter and Ishida. The Maidstone specimen is apparently the youngest of all Iguanodonts of the British Isles dating from the Late Aptian stage of the Lower Cretaceous. Concerning the Hadrosaurs (the so-called “Duck-billed dinosaurs”), the most derived and diversified group of Ornithopods, they were certainly present in the British Isles during the Late Cretaceous period but so far the fossil record has been elusive consisting of isolated dubious teeth (which might as well belong to late Iguanodonts), such as the one named “Iguanodon hillii” from the Cenomanian Lower Chalk Formation of Hertfordshire and “Trachodon cantabrigiensis” from the Cambridge Green Sand Formation of Cambridgeshire (Albian-Cenomanian). This concludes our quick tour of the Ornithopods of the United Kingdom. Carpenter, K. and Ishida, Y. 2010. Early and "Middle" Cretaceous Iguanodonts in Time and Space. Journal of Iberian Geology 36 (2): 145–164. Galton, P.M. 1975. English hypsilophodontid dinosaurs (Reptilia: Ornithischia). Palaeontology 18(4):741-752. Galton, P. M. 1977. The Upper Jurassic dinosaur Dryosaurus and a Laurasia-Gondwana connection in the Upper Jurassic. Nature 268(5617):230-232. McDonald, A. T. 2011. The status of Dollodon and other basal iguanodonts (Dinosauria: Ornithischia) from the upper Wealden beds (Lower Cretaceous) of Europe. Cretaceous Research advance online publication. Naish, D. and Martill, D. M. 2007. Dinosaurs of Great Britain and the role of the Geological Society of London in their discovery: basal Dinosauria and Saurischia. Journal of the Geological Society, London 164:493-510. Paul, G.S. 2007. Turning the old into the new: a separate genus for the gracile iguanodont from the Wealden of England. In K. Carpenter (ed. ), Horns and Beaks: Ceratopsian and Ornithopod Dinosaurs. Indiana University Press, Bloomington 69-77. Paul, G. S. 2008. A revised taxonomy of the iguanodont dinosaur genera and species. Cretaceous Research 29(2):192-216. Fig 1.- Callovosaurus leedsi might have look like Dryosaurus although it is hard to tell from a single bone. If you were asked to cite one dinosaur that lived in the British Isles, chances are that you will mention Iguanodon. Since Mary Ann Mantell discovered the first teeth of this animal while going for a walk in Sussex in the year 1822, countless bones have been unearthed and attributed to Iguanodon extending the geographical presence of this genus from Europe to North America, Africa and Asia and its temporal range from the Middle Jurassic to the Late Cretaceous. In effect, Iguanodon became a so-called wastebasket taxon. Most of the Ornithopods (the group of bird-hipped dinosaurs to which Iguanodon belongs) remains from the British Isles were originally described as “Iguanodon”. In recent years, scientists have started going through this mess resulting in the naming of a number of new genera and restricting the use of the generic name to a single species, I. bernissartensis from the Barremian-Aptian of England and Belgium. One notable consequence of this exercise is that Ornithopod dinosaurs of the British Isles now look way more diversified than previously thought (instead of 3 genera, we now have a dozen or more). 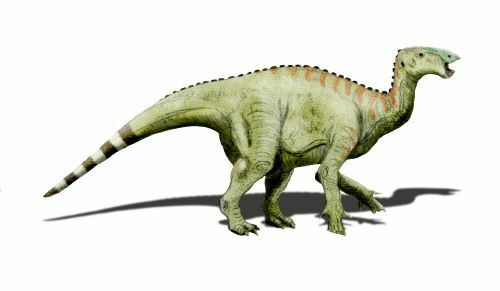 This is the first of a two-part post on the Ornithopod dinosaurs of the United Kingdom. The herbivorous Ornithopods can be classified into a few types or families: the lightly built bipedal Hypsilophodonts and Dryosaurs, the medium sized Rhabdodonts, the more heavily built and mostly quadrupedal Camptosaurs and Iguanodonts, and the variously crested and non crested “Duck-billed” dinosaurs (the Hadrosaurs). Except for the Rhabdodonts, all are represented in the British Isles, although the remains of Hadrosaurs are to date very scrappy and questionable. The most geologically ancient Ornithopod of the UK is known from a single isolated femur: Callovosaurus leedsi (originally “Camptosaurus leedsi”) is from the Oxford Clay Formation, near Peterborough, Cambridgeshire, dating from the Middle Jurassic (Callovian, ~163 MYA). 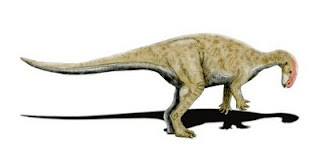 It is hard to say much from a single bone but the animal is either a Camptosaur (Galton, 1980) or a Dryosaur as recently proposed (Ruiz-Omeñaca et al., 2007). Either way, it is the earliest recorded of its kind worldwide. It probably measured something like 2.5 m in length. The next known Ornithopod in geological order is Cumnoria prestwichii (Originally “Iguanodon prestwichii”) from the Kimmeridge Clay Formation in Oxfordshire and dating from the Late Jurassic (Kimmeridgian, ~153 MYA). This one is known from a partial skull and some postcranial elements. 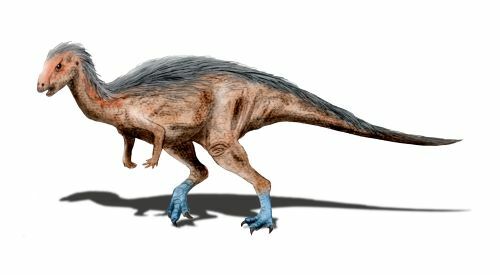 Cumnoria was probably bipedal, measuring about 3 to 3.5 meters in length and looked a lot like the North American Camptosaurus. From the Early Cretaceous (Berriasian ~142 MYA) Purbeck Limestone formation in Dorset, there is a right dentary, which was named Owenodon hoggii (Originally “Iguanodon hoggii”), probably another Camptosaur. The Wadhurst Clay Formation in East Sussex of Early Cretaceous (Middle Valanginian, ~138 MYA) age is home to at least two species of Iguanodonts, the large size (8 m) and heavily built Barilium dawsoni (Originally “Iguanodon dawsoni”) and the medium size (6 m) and more lightly built Hypselospinus fittoni (Originally “Iguanodon fittoni”), both known from partial postcranial remains. A large skull recovered at Henfield, West Sussex, might belong to Barilium. The two new generic names were coined by David Norman in 2010. However, Ken Carpenter and Yusuke Ishida unknowingly gave the name Torilion dawsoni and Wadhurstia fittoni the very same year to the very same fossils, but since their publication came out a few weeks later, Norman’s names for the two animals have priority and thus prevailed. 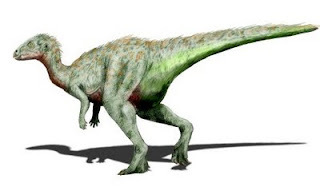 As for differences in the two studies, Carpenter and Ishida made one specimen that Norman included in Barilium, as a separate species and named it Sellacoxa pauli and considered “Iguanodon holligtonensis” distinct from Hypselospinus. From the Tunbridge Wells Sand Formation in West Sussex of Early Cretaceous (Middle-Upper Valanginian age, ~136 MYA), a right dentary was named Kukufeldia tilgatensis (this fossil was previously taken as a specimen of “Iguanodon anglicus”). This is probably another Iguanodont of some sort. This is all for now, folks! Stay tuned for the second part with Hypsilophodon and Iguanodon. Galton, P. M. 1980. European Jurassic ornithopod dinosaurs of the families Hypsilophodontidae and Camptosauridae. Neues Jahrbuch für Geologie und Paläontologie, Abhandlungen 160 (1): 73–95. McDonald, A.T., Barrett, P.M. and Chapman, S.D. 2010. A new basal iguanodont (Dinosauria: Ornithischia) from the Wealden (Lower Cretaceous) of England. Zootaxa, 2569: 1–43. Naish, D., and Martill, D. M. 2008. Dinosaurs of Great Britain and the role of the Geological Society of London in their discovery: Ornithischia. Journal of the Geological Society, London 165: 613–623. Norman, D. B. 2010. A taxonomy of iguanodontians (Dinosauria: Ornithopoda) from the lower Wealden Group (Cretaceous: Valanginian) of southern England. Zootaxa 2489: 47–66. Ruiz-Omeñaca, J. I.; Pereda Suberbiola, X.; and Galton, P. M. 2007. Callovosaurus leedsi, the earliest dryosaurid dinosaur (Ornithischia: Euornithopoda) from the Middle Jurassic of England. In Carpenter, Kenneth (ed.). Horns and Beaks: Ceratopsian and Ornithopod Dinosaurs. Bloomington and Indianapolis: Indiana University Press. pp. 3–16. How many Stegosaurs in the Morrison Formation? Stegosaurus is one of the most iconic dinosaurs from the famed Late Jurassic Morrison Formation of North America. Artists have often depicted the plated “roofed lizard” as the formidable opponent to its nemesis, the fearsome theropod Allosaurus. 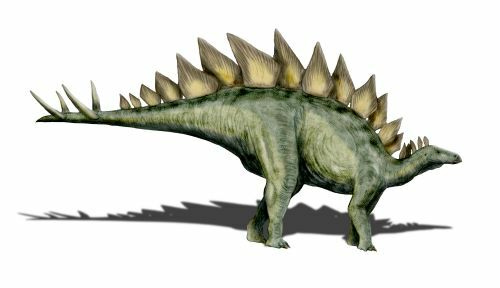 The first remains of a stegosaur have been unearthed in Colorado during the Bone Wars and described by Othniel Charles Marsh in 1977 as Stegosaurus armatus. Since then, numerous specimens were found and described from different areas encompassing the Morrison Formation, in Colorado, Wyoming and Utah. Of the 11 or so names that were given to stegosaur remains from the United States, Marsh has described no less than 7 species. But subtle differences seen in the bones can either be signatures of different species or simply reflect individual variations within the same species. How to define characteristics that are unique to a given species (autapomorphies) is easier said than done when the number of specimens is limited and when remains are fragmentary (i.e. statistics is lacking). In a 2008 review of all stegosaurs, Susannah Maidment and colleagues made some very drastic cuts in the number of species present in the Morrison formation, recognizing only two valid ones: Stegosaurus armatus and Hesperosaurus mjosi that they renamed Stegosaurus mjosi. The other species are either junior synonyms of S. armatus or dubious (nomen dubium). However in another case of the now classic opposition between “splitters” (scientists who think there is only a narrow range of variation inside a species, thus considering more species as valid) and “lumpers” (scientists who think that there are few species with large individual variations), Peter Galton and colleagues in a 2010 paper had a closer look on the various remains from the Morrison formation and found that up to 7 species must be considered valid. 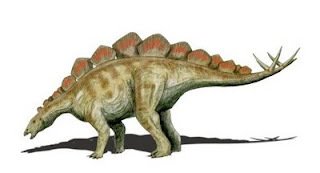 To add a little twist to the story, they infer that the type species, Stegosaurus armatus, is a nomen dubium due to the fragmentary nature of the holotype that does not allow defining any autapomorphy. But if S. armatus were unvalidated, so would be the genus name, Stegosaurus. Consequently, a petition to the ICZN (International Commission of Zoological Nomenclature) was filed to make the best-known species, Stegosaurus stenops as the new type for the genus (good choice, nobody really wants our favorite plated lizard to be renamed Hypsirophus or Diracodon !). In view of the diversity of Ornithopods and Sauropods in the Morrison formation, it is not that surprising to see more than one species of stegosaurs living at the same time there. If we discard the species that are either too fragmentary or not properly described, we end up with some 4 or 5 different stegosaurs in North America. Among them, Hesperosaurus mjosi is the oldest, having been found close to the base of the formation. It is easily distinguishable by the plates, which are longer than taller. Stegosaurus stenops is the best known with several almost complete skeletons. It is characterized by three unpaired alternating dermal plates just before the spikes while Stegosaurus ungulatus has three pairs of small dermal plates there. Interestingly, remains of a stegosaur from Portugal have tentatively been assigned to this particular species. 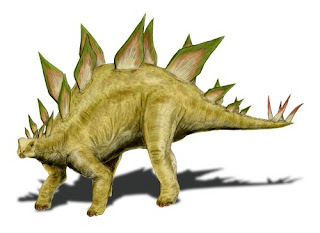 Stegosaurus sulcatus with its large based tail spikes might also be another valid species. Stegosaurus longispinus, characterized by longer tail spines or “thagomizer” is only known from materials from the rear of the animal, which were unfortunately mostly destroyed in the early 1920s. 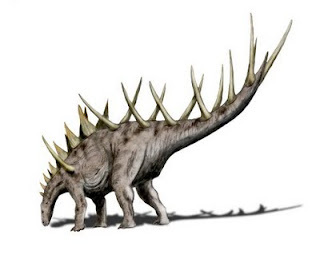 Because of the longer tail spines, some have argued that S. longispinus might have been a Kentrosaurus-like stegosaur, which would need to be redescribed as a new genus. S. C. R. Maidment, D. B. Norman, P. M. Barrett and P. Upchurch. 2008. Systematics and phylogeny of Stegosauria (Dinosauria: Ornithischia). Journal of Systematic Palaeontology 6(4):367-407. P. M. Galton, 2010. Species of plated dinosaur Stegosaurus (Morrison Formation, Late Jurassic) of western USA: new type species designation needed. Swiss Journal of Geosciences 103, 187-198.